A Fife castle once said to be home to 11 different ghosts is to appear in a new reality TV show. 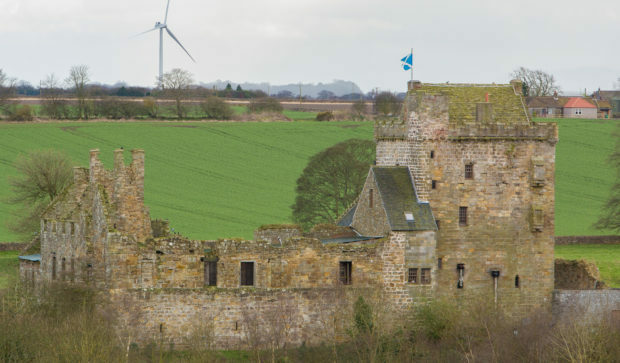 Balgonie Castle near Glenrothes will feature on the Really channel’s Friday evening programme “Help! My House Is Haunted” sometime within the next three weeks. It will be the latest of a number of television appearances for the 14th century pile, best known for the ghost of Green Jeannie. The apparition of a woman, whose face is covered by a hood, has reportedly been seen by the family of Laird Raymond Morris as well as members of the public. Another spirit said to wander the rooms is an old, grey, goatee-bearded man dressed in 17th century costume. There is also a grey man who appears to be opening non-existent doors in the courtyard and a man’s head that floats around the first floor hall. Mr Morris, 88, who lives in the castle, said members of the Scottish Paranormal Society were often at Balgonie and were pleased with their findings. “However, I stress that this is a very happy castle with no evil spirits here at all,” he said. The laird hopes the latest exposure will help solve a decades-old mystery that has been puzzling the Morris family. They have been searching for records of the discovery of a skeleton in the great hall at the start of the 20th century. “When we purchased Balgonie in 1985, amongst the information given to us by the previous laird, David Maxwell, was a copy of The Courier of, we think, about 1912,” he said. Mr Morris can no longer find the cutting in question but is hoping to flesh out the details of the discovery. “Such a find would have been reported to the police and I always meant to contact them, hoping they still have details in their archive,” he said.